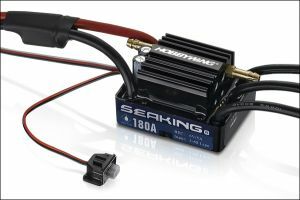 Hobby Wing "SeaKing" 180 v3 Amp ESC with extra large, installed capacitor bank. 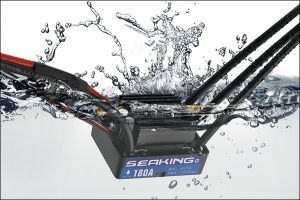 The special firmware designed for RC boats can make the acceleration punchier and the handling more stable. 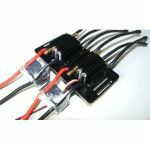 Includes: 6mm Female bullet connectors soldered to the motor side with a loose matching set for you motor of choice. This esc was designed to work in an environment where its possible for the esc to get wet on occasion. Not for use undewater. OSE does not suggest using this item under water!! What is there to say other than the heading. Tough, waterproof, reliable, good over-current capability. The only negative is the fact that it isn't as well cooled as V2 but that's it. This is the best esc in its class. And fully waterproof. I have dunked my esc a few times and stil going strong. A big improvement on V2. I had two of the older models of this ESC and they were always failing due to water contact. I accidentally dunked this one in the water and came out working perfect! I would highly suggest it for lower amps draw setups! This is is by far one of the best esc's ever made for rc boats. BUY IT BUY IT BUY IT....More than just reliable and powerfull..It will last you a long time!